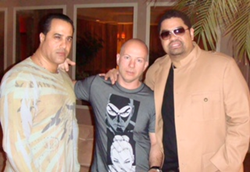 Gordon Bijelonic Films to Produce & Finance Heavy D Scripted Film, "Crossed"
Producer Gordon Bijelonic announced pre-production plans for feature film “Crossed”, written by legendary rapper and actor Dwight “Heavy D” Myers and co-writer Avery O Williams prior to the icon's tragic death in 2011. On May 24th, what would have been the music legend's 49th birthday, Bijelonic, a longtime friend of Heavy D, announces his plan to bring to life a project that was very dear to him. Heavy D and Williams' collaboration over years resulted in a timely and compelling script that represents a passion project which Bijelonic is committed to bringing to the screen. The project is a befitting commemoration of the late rapper's work as a writer and actor, work that served as an integral part of his final years as an artist. "Hev and I were at Jaime Fox's house during a Labor Day weekend BBQ and we both committed to making this movie. This was supposed to be a starring vehicle for him" says Bijelonic. “We're thrilled to be making this movie,” continues Bijelonic, “It’s a way to celebrate the legacy of a great man, and another way for Hev, years after his passing, to continue to take care of his daughter that he loved so much.” Bijelonic will also name Xea as an Executive Producer on the film as an honor to the credit that would have been accorded to her father. As a much loved member of the music and entertainment community, a few significant names are being considered to direct and star in the film. "Hev was loved by the entire community. Friends and fellow Mt. Vernon born artists such as Diddy and Denzel would be a natural fit,"says Bijelonic. Inspired by the true story of a gritty NYPD detective known to Heavy D, "Crossed" artfully tells the story of a tenacious street cop who jeopardizes his life and career when he crosses legal and moral lines to bring a drug kingpin to justice. “Several times we had offers on Crossed’,” says screenwriter Avery O Williams, “and we held back because this was meant to be Hev's leading role. He dropped weight, got buffed, and even starred in a play, all in preparation.” Bijelonic is currently packaging with a keen eye on actors, filmmakers and those within the music community who have been long-time supporters and friends of the artist. "Hev was an Iconic figure in the music industry in the 90's that paved the road for many that followed after, this will not be a difficult film to cast with the kind of material that Hev and Avery wrote." Gordon Bijelonic's recent film credits include Keira Knightley's "Laggies", Robins Williams' "Angriest Man in Brooklyn" & John Travolta's "The Forger" Bijelonic is also currently developing the Nikola Tesla Biopic the Serbian Inventor who lit up the World and pioneered modern electrical engineering. Heavy D helped shape rap music in the late 1980s and '90s with a fusion of New Jack Swing and reggae. He later became an actor, appearing in “Law & Order”and movies such as “Life” and "Tower Heist." As well as "The Cider House Rules" Today, May 24th marks his birthday. He would have been 49 years old.